Take Control of What Your Family Eats Daily.Get Rid of All Of the Harmful Chemicals And Purify Your Food With Organic Gardening! Have you ever considered what the chemicals that are applied to the foods that we eat every day can do to you and your family’s health? It’s quite scary when you think about it. Some may say that the exposure isn’t enough to worry about. We’ve been using chemicals on our food for years, why stop now? But when you think about it, farmers didn’t use chemicals on their crops back in the 1800’s, and they grew healthy, productive food anyway! It’s Time We Got Back To That Way Of Life! We Can Do That By Growing Our Food And Flowers Without Chemicals! When we use pesticides or non-organic fertilizers in our gardens and on our flowers, those chemicals produce a residue that is left behind. Rain can cause those chemicals to seep into our ground water and even our drinking water. Even taking a simple drink of water can expose us to artificial additives that we have no idea we’re ingesting. Were you aware that the farmers who provide us with the grain that makes our bread or the tomatoes that we put on our salads use chemicals to treat their crops? Those chemicals are passed onto us when we consume those foods. What’s even more disturbing is that the majority of those farmers won’t eat the very food that they produce – because they know it contains components that could jeopardize their health. If They Won't Eat Their Own Crops, Why Should We? There are ways to get away from those toxins and start living a healthier lifestyle. Organic foods are not only better for the body, but they taste better and provide more nutrients to nourish us. But part of the problem with organic foods is that they can be very expensive to buy in the store. That’s not a problem! Just grow them yourself. Perhaps you’ve never taken up gardening but have always wanted to try? That’s alright! It’s a perfect time to do so! Maybe you’re an experienced gardener who’s always used chemical treatments on your plants but never thought about the effect those chemicals can have on your food. Even better! With our comprehensive book, “Beginner's Guide to Organic Gardening”, you can learn nearly everything you need to know to garden without the use of chemicals or other harmful substances! Organic gardening isn’t a new age science. What it can be, though, is a new way of looking at the way you feed yourself and your loved ones! It’s all really quite simple. Learn organic gardening the simple way – with this amazing book! There are many things that organic gardening can give you. And this book can set you on your way! This book is like no other guide to organic gardening. We’ll give you over 45 pages jam packed with the information you need to not only get started with your organic garden, but how to keep that garden thriving for years! Plus we’ve given you a guide to the most common garden pests and the way to get them out of your garden – all without chemicals! It’s true, we’re exposed to chemicals in everyday life, but why would you want to knowingly expose yourself or your family to those chemicals in the food that sustains life? We’re guessing you don’t want to! That’s why YOU NEED this book! You could spend a lot of time and a lot of money finding this information yourself. You could surf the internet or buy a different book, but why would you want to when we’re offering you everything you need to know for just $14.95? It’s a huge bargain when you think about it! 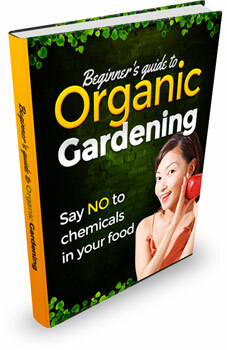 You have it all right here in “Beginner's Guide to Organic Gardening”. You will have this book delivered directly to your e-mail account where it’s available for you to read whenever you want to. No need to wait on the postman to deliver your book, we’ll bring it to you quicker! And the best part of all is that we will give you a 100 percent money back guarantee! That’s right, you’ll have 60 days to read this book and start your journey into organic gardening. If it doesn’t give you the information you need to know to start and grow your own all-natural garden, we’ll give you your money back – no questions asked! And you can keep the book! We’re that confident you will find all you’ve ever wanted to know about organic gardening inside the pages of “Beginner's Guide to Organic Gardening”. I'm so sure that “Beginner's Guide to Organic Gardening” will provide you with the results that you're looking for that I'm willing to back it up for a full 60 days. Gardening in general provides huge health benefits to the gardener and the consumer alike. It’s relaxing to spend time with nature as you cultivate your plants with the TLC that they deserve. And when you get your first bumper crop of all-natural corn, it’ll taste much sweeter than if you had bought it in the grocery store. Don’t wait anymore! Go natural and keep the world chemical free! Order your copy of “Beginner's Guide to Organic Gardening” today. You and your family’s health is definitely worth the $14.95 that you’ll spend! P.S. There’s no risk when you order this book. Remember, we offer a complete 100 percent money back guarantee for 60 days. That’s three whole months to preview “Beginner's Guide to Organic Gardening” and put its valuable information to use in your own garden. The peace of mind alone is well worth the price! Order now and save yourself as well as your family! DISCLAIMER: ANY PRODUCT, WEBSITE, AND COMPANY NAMES MENTIONED IN THIS REPORT ARE THE TRADEMARKS OR COPYRIGHT PROPERTY OF THEIR RESPECTIVE OWNERS. THE AUTHOR/PUBLISHER/RESELLER OF THIS WEBSITE IS NOT ASSOCIATED OR AFFILIATED WITH THEM IN ANY WAY. NOR DOES THE REFERRED PRODUCT, WEBSITE AND COMPANY NAMES SPONSOR, ENDORSE OR APPROVE THIS PRODUCT.